An Australian family has been startled awake after a kangaroo crashed its way through a window in their home. The residents managed to trap the marsupial in a bathroom after it "ran amok" in the house in Melbourne early on Sunday, a wildlife rescuer said. 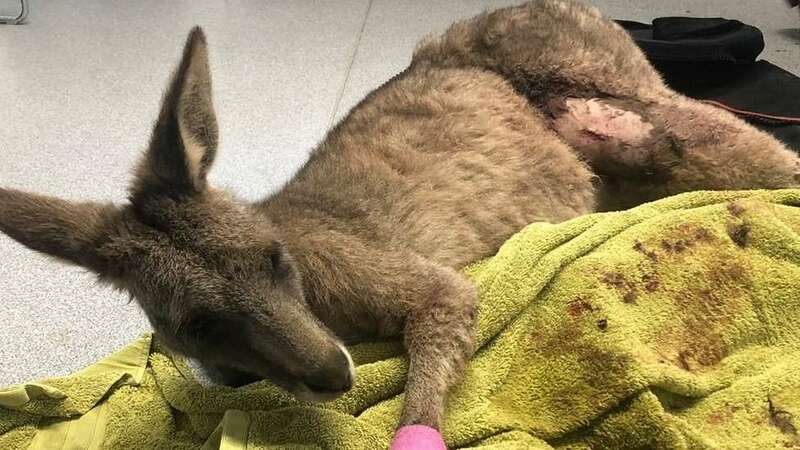 The family was unharmed, but the distressed kangaroo suffered blood loss and cuts to its paws and legs. Rescuer Manfred Zabinskas said the incident could partly be attributed to homes competing with kangaroo habitats. [post_ads]After being called to the home, Mr Zabinskas found the kangaroo "fairly exhausted" in the bathroom, and administered a sedative to remove it safely. "The family was quite concerned about him because of the amount of blood everywhere," he said. He said the "medium-sized" kangaroo, weighing about 30kg (65lb), had caused damage across the house and broken a second window while trying to escape. The incident happened on the outskirts of the suburb Deer Park, close to open fields and known kangaroo habitats. Mr Zabinskas said the animal may have been spooked by a dog or a passing car before jumping into the house. "He would have been in a complete panic and in desperation just run in the path of what would have looked like a passage home, and just gone through the window," he told the BBC. "They do get into trouble in suburbia where we've got urban areas expanding into the fields where they live." The kangaroo has received treatment and is now being cared for by a wildlife rescue service.